Select a test that is appropriate to the age and problem at issue. Perform the test. It will take about 15 minutes. Analyse the result. Lexion explains the basic problem. Let Lexion create exercises according to the results of the assessment. The pupil does the exercises for a period of time at school or at home if you mail the exercises to the family’s home computer. When improvements have been made, retest the pupil. 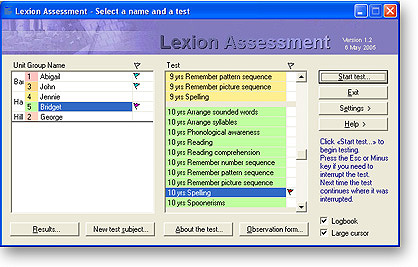 Lexion covers the most fundamental processes in reading and writing acquisition, e.g. phonolo­gical awareness, letter-sound correspondence, syllable and morphe­me segmentation and blending, etc. Grammar, spatial skills, arithmetic and under-standing of the clock, and other aspects are also covered. Lexion is a computer software developed in Sweden since 1992. About 80% of the Swedish schools use Lexion, mostly on a daily basis. One of the reasons for introducing an English version of Lexion is our experience that many pupils in the UK need structured training in basic cognitive language processes before and during the acquisition of reading and writing skills. There are numerous reasons for these skills not developing in the expected manner. One important observation is that there may be a good development of elementary phonological abilities, but this does not necessarily mean that the deeper phonological awareness, needed for normal reading and writing skills, will improve automatically. Many pupils will acquire a logographic type of reading and use it for a long period. The complex English orthography and the variation of dialects may be some of the reasons. English children need a longer period of education in phonological reasoning before letters are introduced. The risk of confusing phonemes and letter names is imminent, which affects the acquisition of decoding and spelling, resulting in fragmentary reading habits. Using Lexion Assessment means a standardised testing situation. The same instructions are given by the same ‘administrator’ each time. The results are compiled and appropriate measures are proposed. The thoughtful Lex Testor takes care of the testing procedure, so you as an observer may make notes about the qualitative aspects of the individual’s performance. The test results are displayed in figures and charts. The findings are also summarized in ordinary text format. Lexion automatically creates appropriate exercises according to the test results. Later the individual may be reassessed with the same or other tests. The assessments are firstly a tool for deciding if a certain child will have difficulties in reading and writing during the first years in school. Secondly, the assessments may be used as a screening tool at any age when a new stage in reading and writing education is to begin, or when you think that a certain level of ability should be present for an individual. The assessment contains several parts. Each age from Year 6 and up has its own test parts. There are 5-10 test areas depending upon age group. The test results are compared to norms collected from normal children of the same age. Our experience so far proves that children enjoy being tested with Lexion Assessment. The special approach awakens curiosity and the children concentrate surprisingly well for long periods.